Very late again, the official April temperature figures are out. 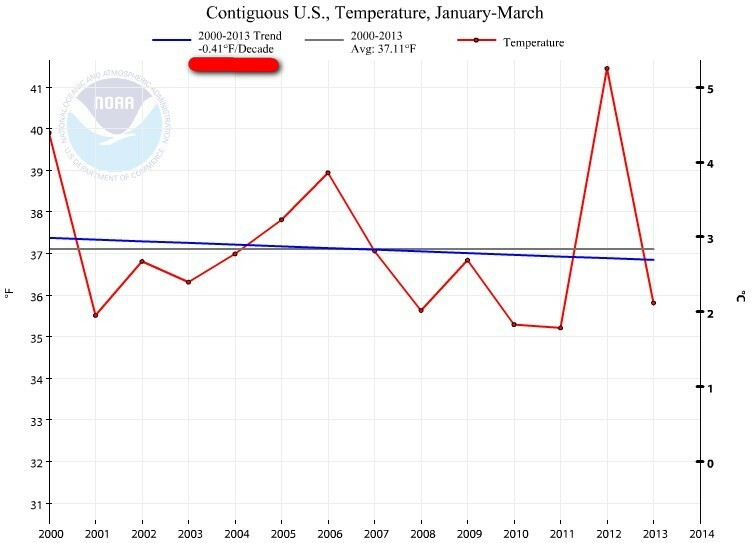 Last year the temperature anomaly was 3.66 F and this year it is – 1.35 F.
As a complement to my previous post Recent 3 Months U.S. 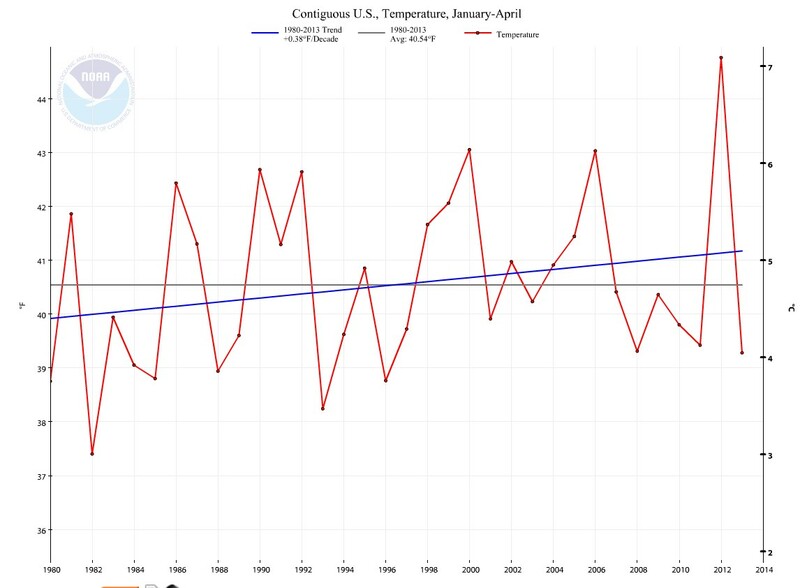 Temperature trend/decade: – 4.1 F COOLER in 100 years, I thought it also would be interesting to look at the recent 4 months (year to date, January- April) US temperature from a “historic” perspective. To see how the decade trends have evolved during the last 113 years. I don’t know about you, but I consider a 4 month, a year by year consecutive trend 113 years long to be a “quit good” indicator. 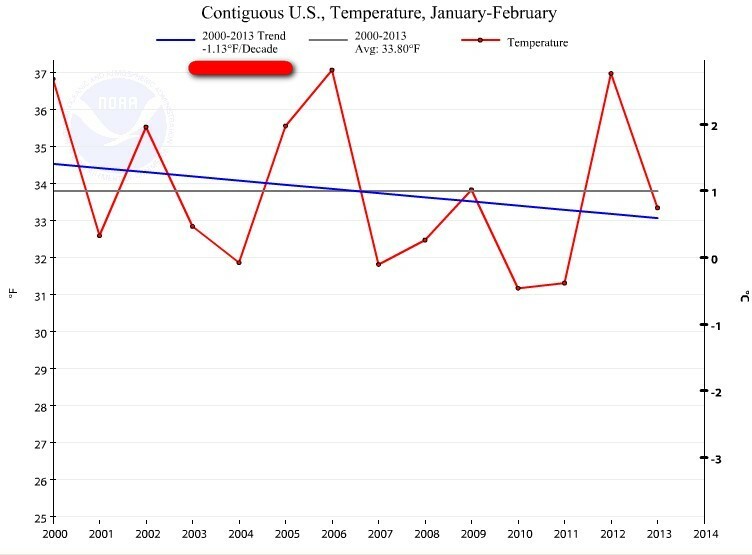 So the “warming trend” 2000-2013 for Jan- Apr is exactly – 0.54 F degrees a decade. That is – 5.4 F COOLER in 100 years. That’s what I call “warming”! 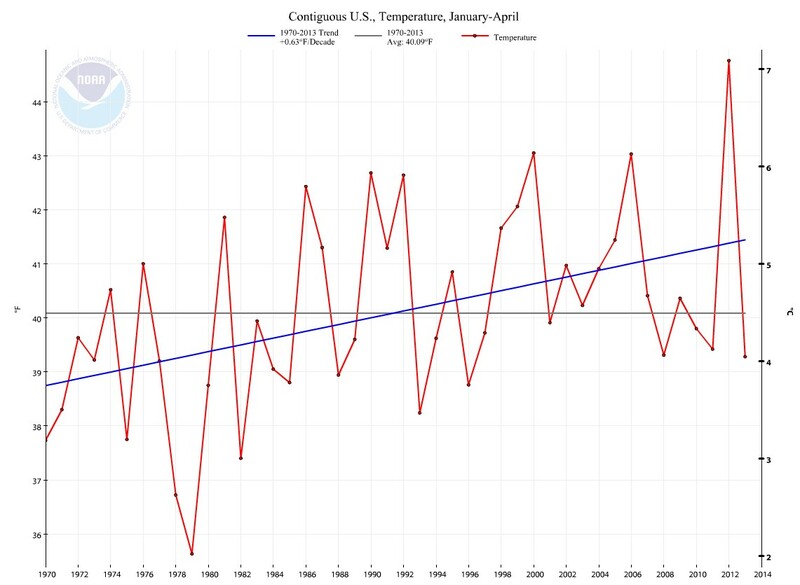 The recent 4 months trend 1970-2013 is exactly 0.63 F degrees a decade. 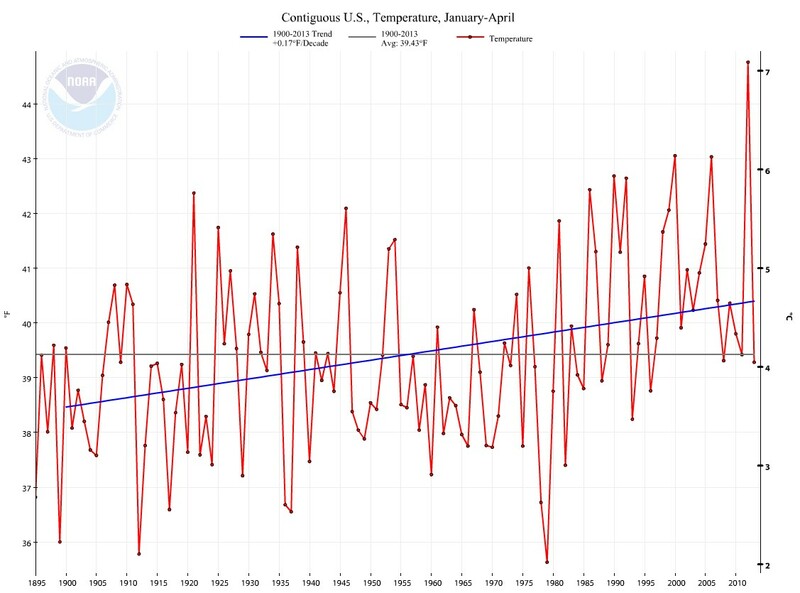 The recent 4 months trend 1980-2013 is exactly 0.38 F degrees a decade. 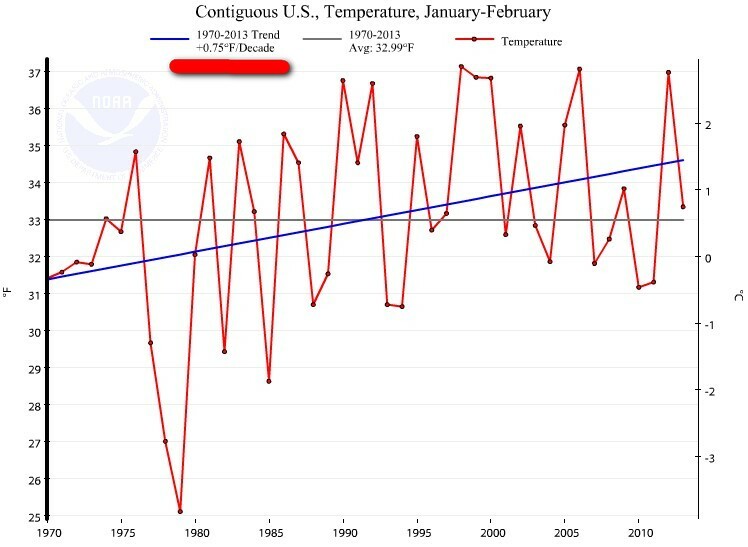 The recent 4 months trend 1990-2013 is exactly– 0.07 F degrees a decade. 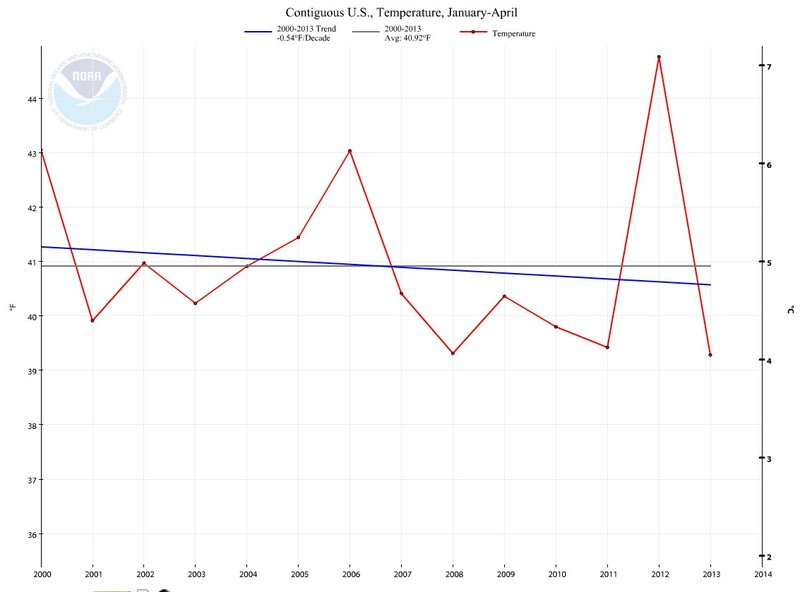 The recent 4 months trend 2000-2013 is exactly – 0.54 F degrees a decade. 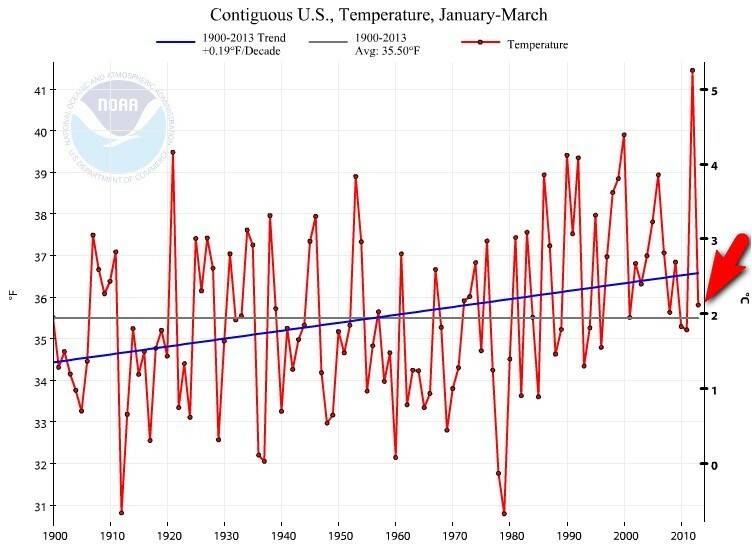 Very late, the official March temperature figures are out. 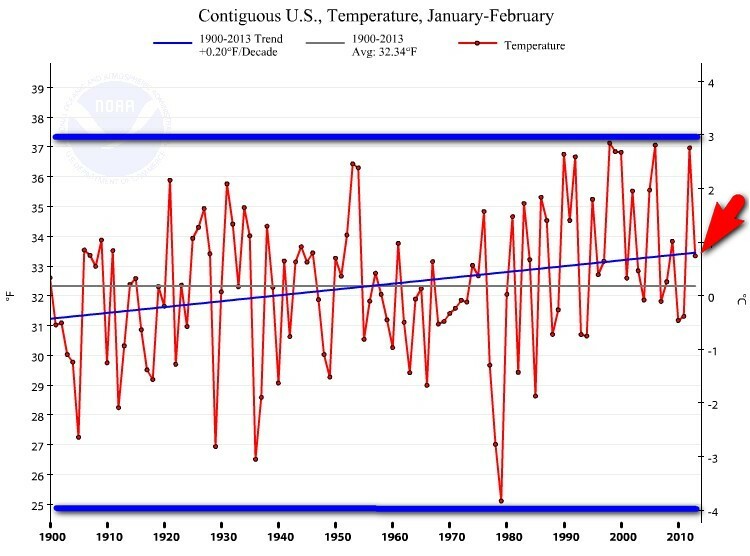 Last year the temperature was 8.55 F and this year it is – 1.09 F.
As a complement to my previous post Recent 2 Months U.S. 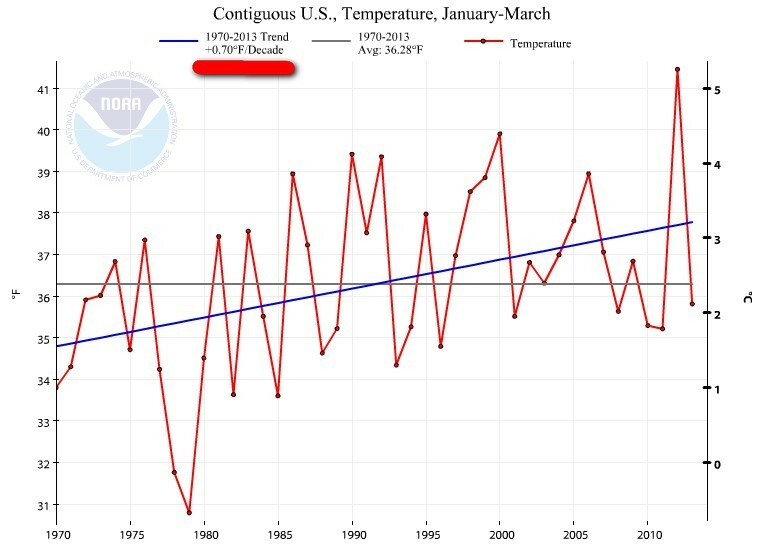 Temperature trend/decade: – 11.3 F COOLER in 100 years, I thought it also would be interesting to look at the recent 3 months (year to date, January- March) US temperature from a “historic” perspective. To see how the decade trends have evolved during the last 113 years. I don’t know about you, but I consider a 3 month, a year by year consecutive trend 113 years long to be a “quit good” indicator. 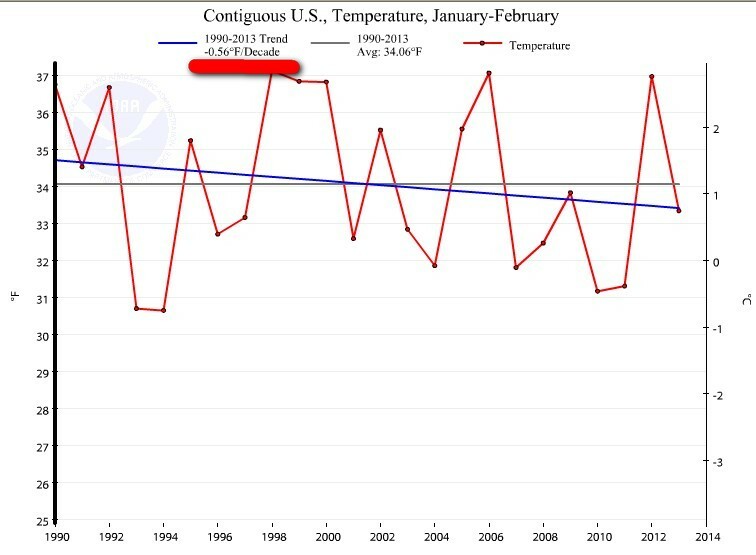 So the “warming trend” 2000-2013 for Jan-Mar is exactly – 0.41 F degrees a decade. That is – 4.1 F COOLER in 100 years. That’s what I call “warming”! 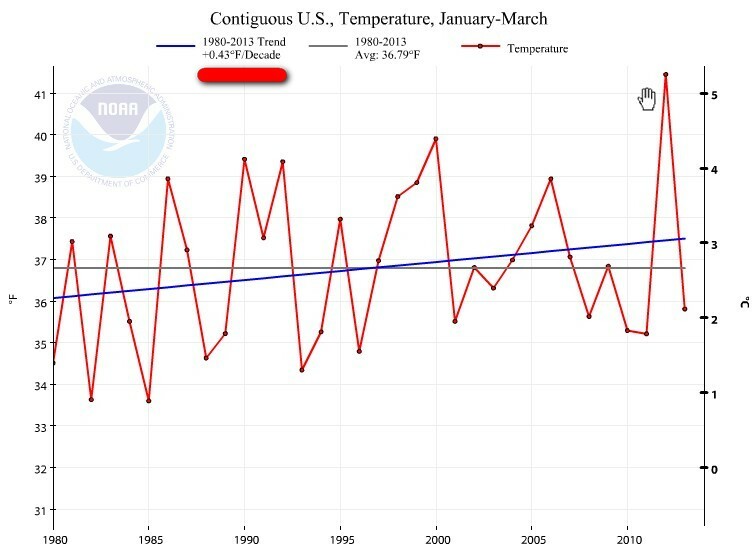 The recent 3 months trend 1970-2013 is exactly 0.70 F degrees a decade. 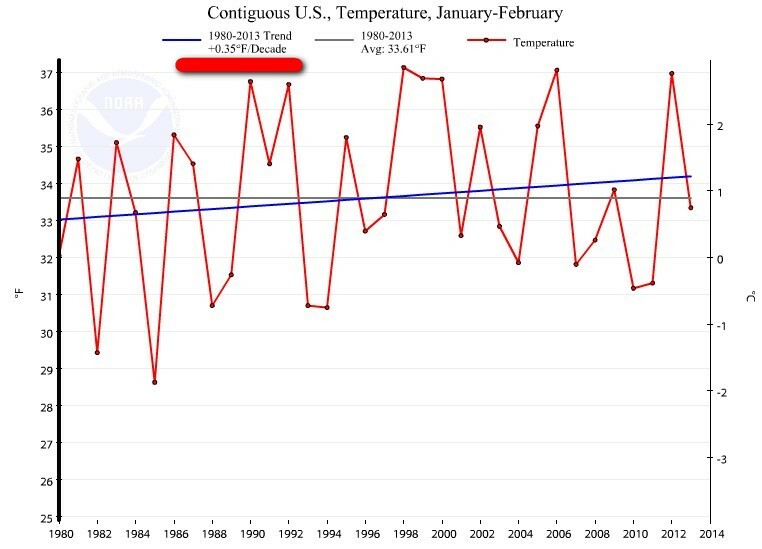 The recent 3 months trend 1980-2013 is exactly 0.43 F degrees a decade. 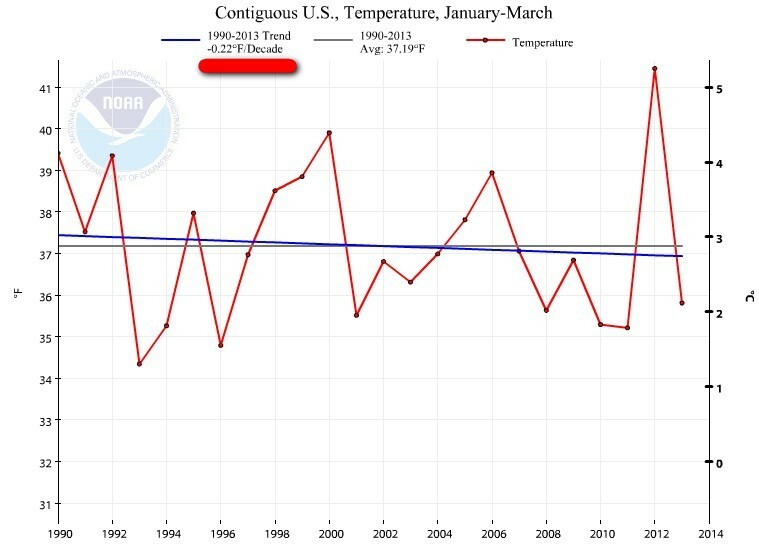 The recent 3 months trend 1990-2013 is exactly – 0.22 F degrees a decade. 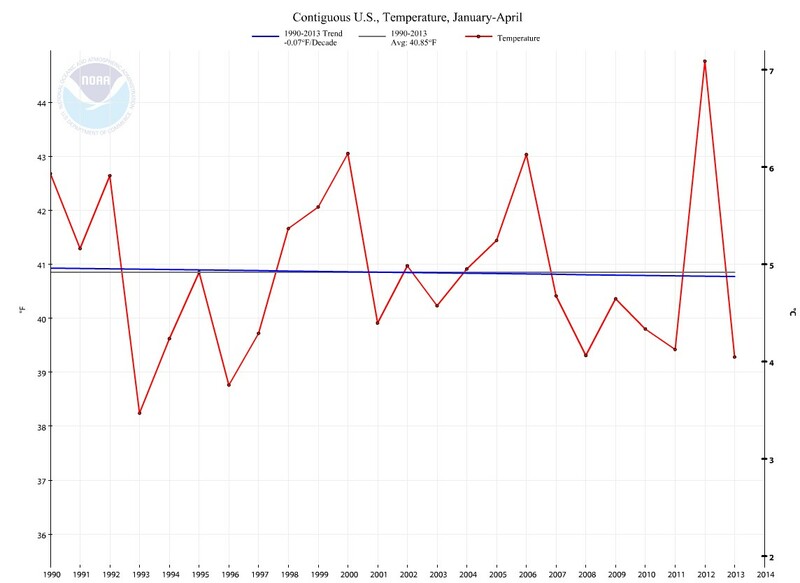 The recent 3 months trend 2000-2013 is exactly – 0.41 F degrees a decade.